The term "root rot" in potatoes refers to any disease that affects the roots of the plant. Fungal diseases are the cause of root rot, according to North Dakota State University. Root rots cause the plant to suffer an overall decline and may also affect other parts of the plant such as the leaves, stems and tubers. Potatoes have shallow, horizontal roots called rhizomes. It is from these rhizomes that the tubers, or potatoes, develop. The rhizomes are covered with hair roots. It is from those tiny roots that water and nutrients are absorbed. It is also where fungi present in the soil can enter and attack the plant. Symptoms of potato root rot can vary depending on the cause. Spots may appear on the leaves and stem. The stem may be soft and mushy where it meets the ground. The foliage may turn yellow as the roots become unable to absorb moisture, and the plant may stop growing and start to wilt. Potatoes may be disfigured or visibly rotting. In some cases, such as the case of verticillium wilt, by the time symptoms appear it may be too late to save the potato plant. Rhizoctonia disease is a fungal disease caused by the fungus Rhizoctonia solani, according to Cornell University. This soil-borne fungus attacks all underground portions of the plant and is particularly serious in areas that have cool, wet soil during the spring. Verticillium wilt is caused by two different verticillium fungi that live in the soil and enter the plant through the roots. Once the fungus has entered the plant, it spreads through the plant using the vascular system, according to the University of Maine. There are also other types of fungi that can cause root rot, but these are the two most prevalent. 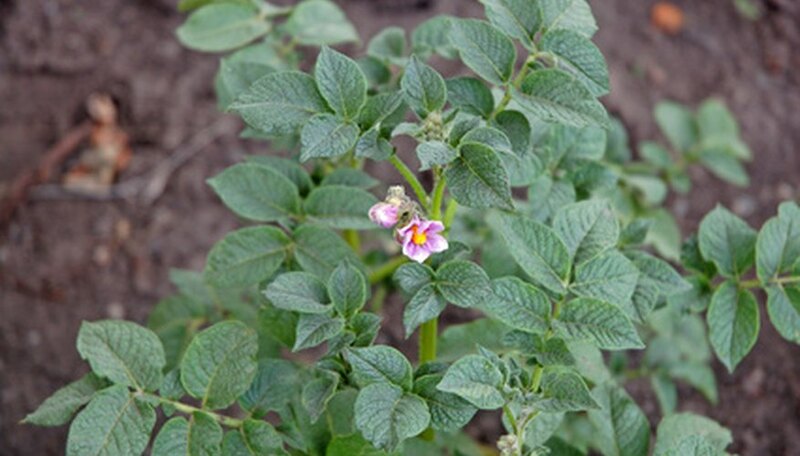 Potatoes should not be planted where other vegetables affected by root rot have previously grown. Many of these fungi can live in the soil for years. They should also not be planted anywhere near tomatoes, as many of the diseases that affect tomatoes also affect potatoes, according to North Dakota State University. Overwatering can also hasten and encourage the growth of fungi in the soil, so be sure to keep the soil barely moist but not soggy. Finally, do not plant potato seeds during cool, wet periods. Remove infected plants immediately from the planting site so that the fungus may not spread to other plants. In addition, remove all plant debris, as fallen leaves may harbor fungal spores. Drench the soil with a fungicide, and do not plant any other vegetables in that area for three years. Potato crops should be rotated every three years anyway, according to the University of Maine.